Minded Security Blog: "jQuery Migrate" is a Sink, too?! 1. 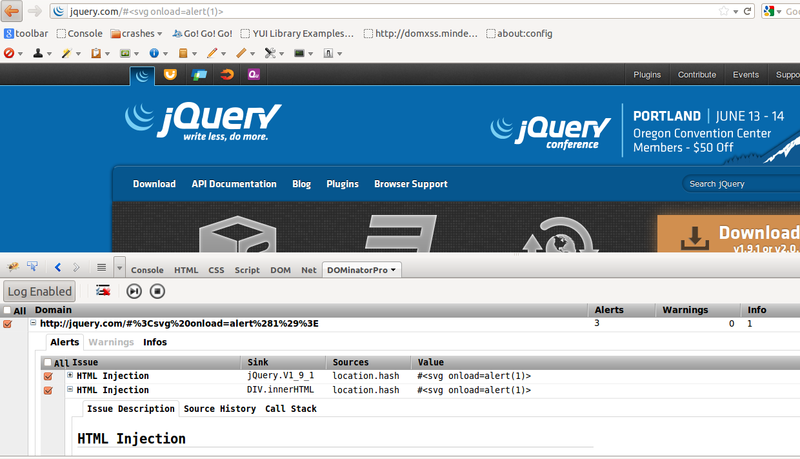 Mario already said he tried to contact security@jquery.com which seems it does not exists. <- Really in 2013? What about a catch-all mail? 2. I have to say that the potentially dangerous use of jQuery is a well known fact. So if parseHTML is added in order to recreate the old behaviour, it's not a bug, it's an expected feature. That's my personal opinion. 3. I really think that it's not jQuery fault in the end. If a jQuery user explicitly performs output encoding when requested, then jQuery should not be "fixed" with those ugly workaround. Do you blame, $.html() for it's "sinkness"? or strcpy for not checking the length? As I said, it was not tested. "..and, of course, feel free to improve it and paste it in a comment." ..and if it does not work.. well feel free to fix it. As of today, security@jquery.com (or .org) is where to email secutiry issue reports. Good :) A first positive result after the drama. What remains to be done is a fix for the plugin and get rid of that nasty regression. is vulnerable or not ?